If you feel you have acid reflux in your throat there are a couple of things that you can do that will help. Though I would like to say that if this is a constant thing you are experiencing it may be something for you to further investigate as there could be a direct relation to a thing called LPR which stands for Laryngopharyngeal Reflux. 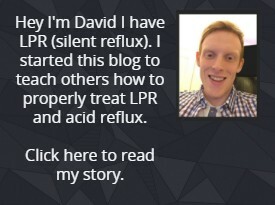 Someone with LPR is someone who has throat symptoms because of reflux and often won’t have any other reflux symptoms like heartburn for example, that’s sometimes why LPR is also referred to as silent reflux, because the primary and usually main symptom is related to problems with the throat. If you feel this is a frequent problem you have I would recommend checking out my complete guide on LPR which covers causes, symptoms and treatment. If you just have acid reflux in your throat once in a while my advice below will definitely help as well. The best thing you can take that should give an immediate relief is Gaviscon Advance the UK version. The main reason I specify the UK version is because it has the most important ingredient which is called (sodium) alginate. Alginate is an extract from seaweed which when taken creates a foam type layer on top of the stomach contents. This layer basically acts as a barrier which helps prevent any acid reflux from coming up your esophagus and getting into your throat. The reason we want the UK version is because is has a much higher concentrate of this alginate which is the most important ingredient. Luckily if you are from the US you can buy this version of Gaviscon on Amazon here. For more information on why Gaviscon Advance (UK Version) is the best choice for someone with reflux click here. If you don’t want to wait for delivery and want relief now taking the US version of Gaviscon should help somewhat but I would advice getting the UK version as soon as you can. Alongside taking the Gaviscon I would recommend some diet changes especially if you are frequently getting acid reflux in your throat. When someone has burning and other issues with their throat that is related to reflux it is primarily caused by a thing called pepsin. Pepsin is an enzyme in the stomach that helps digest proteins. The problem with this pepsin is once it gets in the throat it can lay dormant for 1-2 days based on what early research suggests. The problem with this is if something more acidic enters the throat when you eat it makes this pepsin more active again which can in turn irrigate your throat further because the pepsin is trying to digest your throat! For more detailed information on pepsin check out my complete LPR guide here. Because of this you should be avoiding things that are more acidic, not only because they can cause reflux but because reactivating the pepsin will give you issues with your throat. Below are my recommendations. These are my first steps I recommend for diet changes, if you want a more detailed diet plan to stop and prevent burning throat check out my Wipeout Diet Plan here. If you are someone who is suffering from this acid related throat issues frequently I would suggest checking out this article – Silent Reflux Treatment. A good way to know if you have acid reflux into your throat is based on symptoms. I have an article called LPR Symptoms where I talk about the common symptoms of someone will LPR (acid reflux into the throat). Finally, if you are unsure if your symptoms are related to acid reflux I also have a test available on my site called the RSI test which stand for Reflux Symptom Index. Based on your symptoms if you score over a certain score it can quite accurately determine if you have reflux into your throat. The test is here. Next articleMelatonin for Acid Reflux – Is it Effective?